Like a normal burrito, only better in most ways. The crispy diner-style hashbrowns, loads of melty cheddar, eggs, and bacon make the breakfast burrito at Lucky Boy the absolute platonic ideal. If you only eat one breakfast burrito for the rest of your life, it should be this one. La Azteca might be known more for its non-breakfast burritos—though no one should judge you for eating a chile relleno burrito before noon—but when you wrap carne asada, eggs, and silky refried beans in one of their flaky, slightly transparent flour tortillas, you get an incredible a.m. rendition. There’s the standard bacon and chorizo options, but if you want the best of Cerveteca’s all-day breakfast burritos, go with the chicken. Yeah, chicken. Why not? Tender, braised, spicy, shredded chicken with black bean puree, eggs, and cheese makes way more sense in your mouth than it does on paper. The Fairfax coffee shop has always made some of the best breakfast burritos in town, but they took the game to a whole new level when they started adding Ugly Drum pastrami into the mix. Pastrami: like bacon, but better. The Westside mini chain (just Googled it and apparently they have a DTLA location too, cool) does one of the best machaca burritos in town. Shredded beef, grilled peppers, and eggs all wrapped up in a tasty convenient flavor delivery system. Yeah, now we’re getting into fancy territory. At the revamped Rose Cafe in Venice, chef Jason Neroni is slapping eggs, crispy potatoes, braised bacon, cheddar, and peanut mole into a tortilla, and even though it comes with a $16 price tag (like we said—fancy) it is absolutely fantastic. As a former proud Westwood resident, this is a total homer pick, but I’ll stand by it any day. Whole slices of bacon, tons of cheese, eggs, and hashbrowns made from thin-sliced potato rounds combine to form a perfectly simple burrito. Dip it in ketchup (because I’m shameless) or drench each bite in their deceptively spicy house salsa. All-you-can-drink coffee is a plus, too. 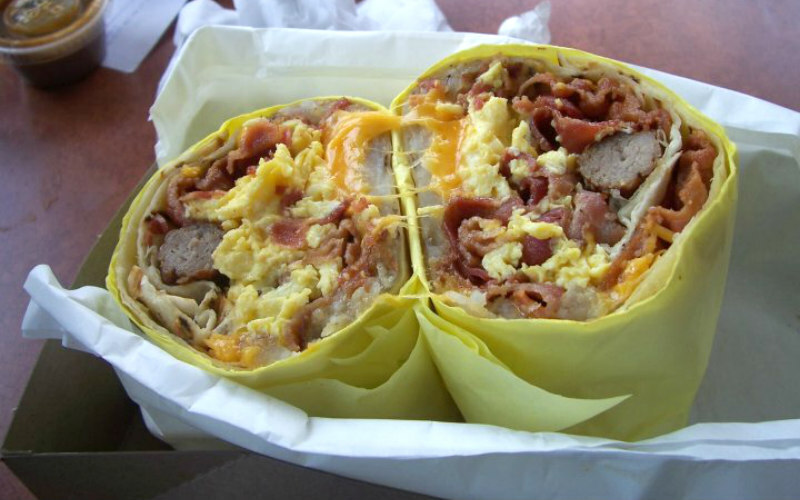 We all need more 24-hour breakfast burrito restaurants in our lives. We all need more Lucy’s Drive In in our lives. Very few things in the world beat a chorizo and egg burrito at 3 a.m. Sometimes it comes with bacon, sometimes it comes with pork belly sausage, and sometimes it doesn’t exist at all. But when chef Wes Avila decides to put his breakfast burrito on the always-changing menu at Guerrilla Tacos, the city is grateful for it. The chilaquiles burrito from Tacos Villa Corona—made mainstream famous by Anthony Bourdain—is all spicy, carb-rich, breakfasty goodness. PRO TIP: add steak to it. Because steak. This Greek-American diner has the classic line-up of breakfast meat-filled burritos, but you’re here for the aptly(-ish) named Golden Greek: Ham, whole sausage links, and bacon wrapped up with two eggs, hashbrowns, and cheddar. Whether you get the bacon, sausage, carne asada, machaca, or sauteed veggie breakfast burrito, they all come stuffed with french fries, and eating a burrito stuffed with french fries is a great way to start your day. They only exist on Sundays at the Mar Vista Farmer’s Market, but it’s worth the trip. A little bit of cheese is griddled right into the tortilla, and it gets filled with your choice of sausage—bratwurst, kielbasa, cheesy chicken ortega chile—sauteed spinach, eggs, potatoes, and cheese.